Ramzzess has posted a sound demo video from the upcoming Boeing 757-200 for X-Plane. IRIS Simulations has posted a sneak peek video from the upcoming F-15E Strike Eagle for FSX. Ramzzess has posted the first in-sim pictures from the upcoming Boeing 757-200 for X-Plane. Take On Helicopters Community Preview build 83006 is available. Note: Arma 2: Operation Arrowhead is required. Laminar Research has released X-Plane 9.70 for Android. "This release adds three new aircraft to the existing market. The A-40 Albatross, the L-1011 TriStar and the CitationJet CJ1. In addition, we also have added system/equipment failures and bird-strikes to make things a bit more challenging for advanced users. Lastly, there have been numerous bug fixes and stability improvements to the system. Head on over to the market and check for your update! It may take a couple of hours to make its way through Google’s system." McPhat Studios has posted several renders of an ATR 72-500 on their Facebook Page. Lionheart Creations is holding a Hangar Sale with 50% off most products. Sale Ends July 24th 2011 at 12:00 PM. Orbx has posted a status update regarding their upcoming Diamond Point scenery and the PNW.004 Patch. Nick from Angle of Attack has released another video showing the cockpit from the PMDG 737NGX for FSX. Commercial Level Simulations has posted the first pictures from the Boeing 747-200/300 version 1.5 for FSX and FS2004. Aerosoft has posted more preview pictures from the upcoming Antarctica X for FSX in the Aerosoft Forums. Thomas Ruth has released patch version 1.0 to his freeware Duesseldorf Intl. Airport (EDDL) for FSX. The freeware Marsa Alam Intl. Airport (HEMA) scenery is now available at AVSIMrus for FSX and FS2004. A new preview video from the Bell Helicopter 412 for X-Plane has been posted on YouTube. The freeware International Space Station for X-Plane is now available to download at X-Plane.org. Ben Supnik has posted more articles from the X-Plane 10 development and possible alien abductions. Pacific Islands Simulation has posted several preview images from the version 1.1 update to Tonga for FSX. Eiresim has posted several night lighting previews from London Luton (EGGW) for FSX and FS2004. Nick from Angle of Attack has released a walk-around video from the PMDG 737NGX for FSX. Baja Sim is holding a competition to guess their next airport project for the chance to win a free copy. Beta screenshots from Kuala Lumpur Intl. Airport (WMKK) have been posted in the AI-China Forums. New preview pictures have been posted from the upcoming Aerosoft Stavanger X (ENZV) for FSX. Aerosoft has released an update to Dangerous Airports 1 for FSX. Read the announcement here. Non Slippery runway at Barra. Autogen Fix for Dangerous Airports 1. Vidan Design has released patch version 02 to Bornholm Airport X (EKRN) for FSX. Flight Sim Labs has posted the first picture of the external model from the upcoming Airbus A320 for FSX. Orbx has posted more preview screenshots from the beta version of Essendon Airport (YMEN) for FSX. 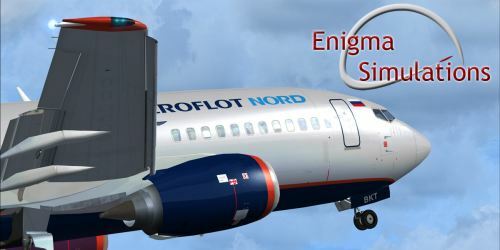 Enigma Simulations has posted several Aeroflot-Nord pictures from the upcoming Boeing 737-300 for FSX. Drzewiecki Design has posted the first preview pictures from Kraków Balice 2011 (EPKK) for FSX and FS2004. AivlaSoft is offering 20% off on the purchase of an Electronic Flight Bag license. From July 20th, until August 20th, 2011. 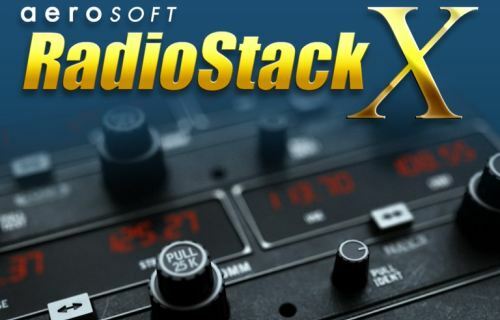 Aerosoft has released the RadioStack X for iPad and FSX. Details and purchase at the Aerosoft Online Shop. Freeware Bell 206B III JetRanger Low Skids and Floats for FS2004 from Owen Hewitt and George A. Arana. Don Grovestine and Ken Peters have released the freeware Nanaimo Airport (CYCD) 2011 for FSX and FS2004. View the door animation preview video from the upcoming Bombardier BD-100 Challenger 300 for X-Plane. Ramzzess has posted more livery previews from the Boeing 757-200 for X-Plane in the X-Plane.org Forums. feelThere has released the San Francisco International Airport (KSFO) add-on for Tower! 2011. Carenado has released the long-awaited Cessna CT210M Centurion II HD Series for FSX. Updated: Now also available at SimMarket. Reality XP integration with 3D Gauges. Fresnel maps allowing realistic reflections and lighting. HD textures and same textures in LITE version for less powerful computers. HD quality textures (2048 x 2048). Carenado GNS530 and GNS430 installed. Customizable panel for controlling windows transparency, instrument reflections and static elements such as wheel chocks, pitot cover and sights props. Pop upT210M Centurion manual with normal, emergency checklist and performance tables. Tested by real Centurion pilots. Realistic night lights effect on virtual cockpit..
FSX features: external dynamic shadows, internal dynamic shadows on VC, volumetric normal mapping, specular mapping and bloom lights. Thai Creation has released Ho Chi Minh City - Tan Son Nhat International Airport (VVTS) for FS2004. All major airport buildings included with high resolution textures and beautiful texture in the night time. Extremely detailed taxiways and runways. Custom made lines, taxiway and taxi lights. Custom Gmax ground texture from satellite photos. Much more to discover by yourself. A new post at the PMDG Facebook Page details the Boeing 737NG Short Field Performance Package. iFlySimSoft has announced the release of Service Pack 1 to the Boeing 737NG for FSX. Orbx has released FTX North America Gold - Central Rocky Mountains for FSX. Details at the Orbx Website. Over 450 airports have been upgraded! The perfect addition to NA BLUE series! FSDreamTeam is offering several launch promotions for the new Hawaiian Airports Volume 2. 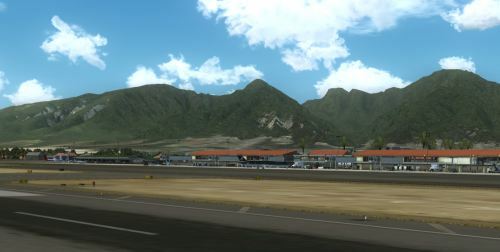 FSDreamTeam has released Hawaii Airports Vol2. Kahului (PHOG) and Kona Intl. (PHKO) for FSX and FS2004. Fully customized ground and runways in high resolution, both in FSX and FS9. NEW YouControl™ feature: custom airport actions with easy on-screen menu to trigger animations, events,etc ( FSX only ). AES support in FS9 planned. 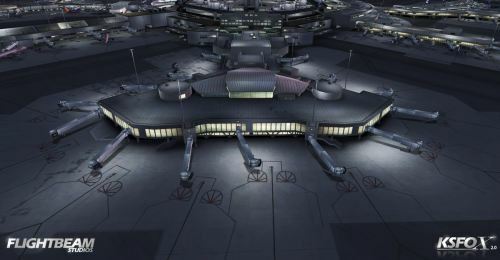 FlightBeam Studios has posted more preview screenshots of Terminal 2 from San Francisco (KSFO) V2.0 for FSX.